There is no perfect car. Regardless of how good a machine is when it is released, there will always be enthusiasts looking to modify and improve. This even holds true for one of our all-time favorites, the Mazda MX-5 Miata. Most of us can agree that Mazda’s little sports car is about as close to perfect as one can expect in an affordable machine. Dig a little deeper, though, and you’ll find those who long for more power, a higher redline, and a more aggressive disposition. David Calzada is one such enthusiast. David grew up a Honda fan, but was deeply smitten by Mazda’s two-seater after driving one at a local autocross. David’s mind was restless after that first drive: He loved the Miata’s agile chassis and rear-wheel drive, but longed for his Integra’s intensity and ferocious climb to redline. The fix was a simple idea, but not so simple in execution: install a Honda K24 engine into a Miata. Engine swaps into Mazda’s MX-5 are hardly a new thing. From rotaries to big American V8s, the Miata’s engine bay has played host to many different power plants. What made the K24 swap intriguing was that it wouldn’t change the overall nature of the Miata, just amplify it. As David explains, “We wanted to put the best naturally aspirated engine ever into the best chassis ever.” As a bonus, this engine was found in Acura’s very popular TSX, making good running examples inexpensive and easy to find. After many late-night discussions with friends, David decided to tackle the project, and KMiata was born. We had a chance to sample David’s creation on a recent visit to Chicagoland, and came away impressed. 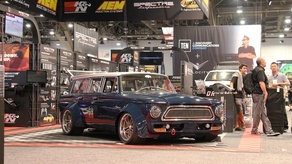 This is not a typical project car build with sharp edges, rough details and excuses. 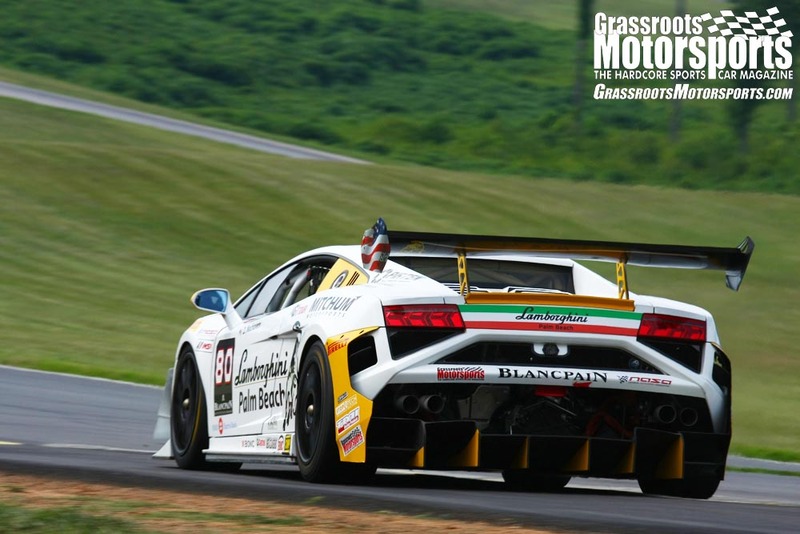 David drove the car to meet us, and while it’s aggressively built for the track, his creation had no issues dealing with stop and go traffic, idling, or any other day-to-day task. The K24 not only looks like it belongs in the Miata, the difference in performance is striking. 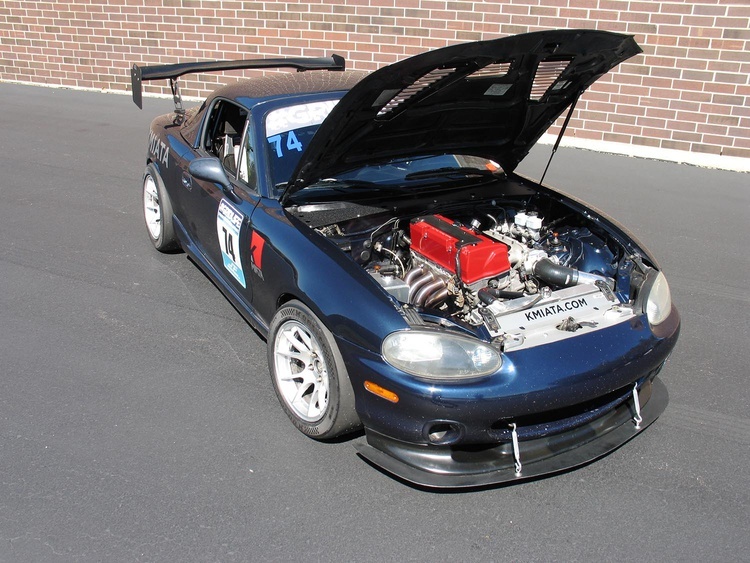 Thanks to a little tweaking, the K24 engine in David’s Miata makes 230 wheel horsepower and 180 lb.-ft. of torque. 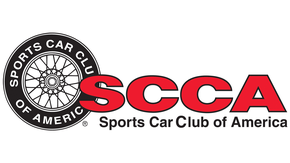 These are S2000-type power figures in a car that weighs approximately 500 pounds less than that vehicle. 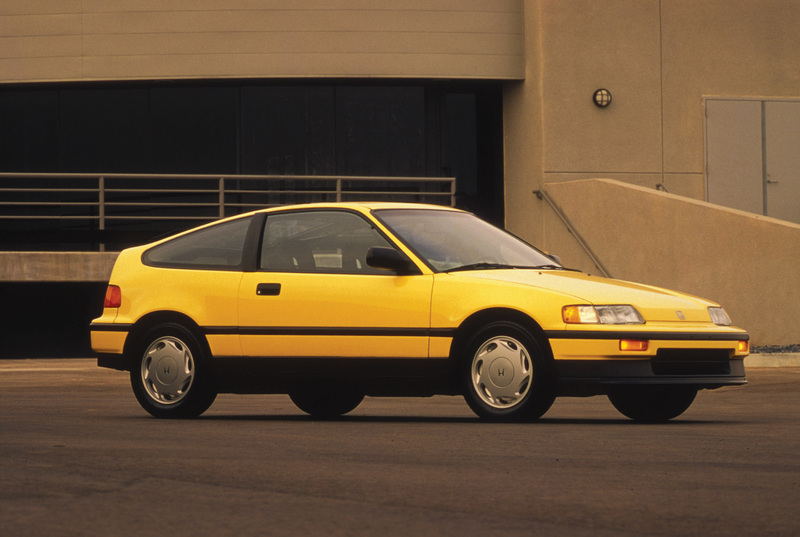 To top it off, the redline soars to 8200 rpm, and that transplanted engine makes that unmistakable Honda ripping noise once the VTEC is engaged. During each step of this build David aimed to simplify, engineer and develop a package that would be easily repeatable–and reliable, too. During our test drive his car performed admirably, without any of the crudeness usually found in builds of this sort. It feels like the Miata was born with the Honda engine; clever engineering of the electronics means even the gauges worked. The car felt as composed as a factory build. If you’d like to bring your Miata one step closer to perfection, KMiata will sell you everything you need to complete this swap. They can even source a K24 engine for you, build it to spec, and design an ECU around your needs and wants. A total package will run the builder about $8000–the individual parts can be purchased as well–but with the prices of NA and NB Miatas as low as they are ever likely to go, now could be the time to create the MX-5 of your dreams. Join Free Join our community to easily find more Honda and Mazda articles. Every damn time I think I'm over Honda, something like this happens. Every time. quick ebay search shows k24s at $1k or less all day. Probably could snag one for less than $500. Does anyone make a rear-sump oil pan for the k series? (off to google I go). Right there I knew: magazine article. You guys talk weird. Is keeping power steering an option? Would this be difficult to replicate in a classic Opel? It's mostly a cost/hp issue. If you're happy with 150-180hp then all the Miata bits play nice fairly cheaply. If you look at the bits to make the K-motor work it's quite a lot more expensive, but you can also get 250hp without stressing the system and 400+ if you have snail room and even more budget. Design considerations aside, the extra displscement is your friend. I mean 150-180bhp would be plenty in a Spitfire but I like Honda motors better then the Miata motor in terms of character. The KMiata guys were working on - and I think now have kits to put BMW ZF transmissions behind the K in a Miata. The next step is putting a K in a BMW using their transmission adaptor kits. I have evil thoughts about doing the same to my 318ti. You can do a K swap for more like $8k. That's a very different number than $15k. I'd personally love to build a monster K-swapped Exocet. But I don't have $25k lying around to do it how I'd want to. Yup, kit is out to install BMW ZF and Getrag 5- and 6-speeds in a Miata behind Honda K-series and Mazda BP-series engines. So, in theory, you could use part of the kit to install a K in front of a BMW trans in a BMW. 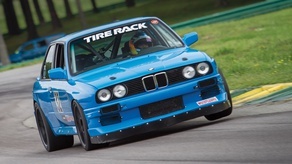 Also, theoretically, you could use the kit to mount the BMW trans in a Miata, then toss out the bellhousing/flywheel adapters and bolt, say, an S54 to that trans in the Miata. Yes and no. It all depends on your resourcefulness and the amount of trick stuff you want on it. 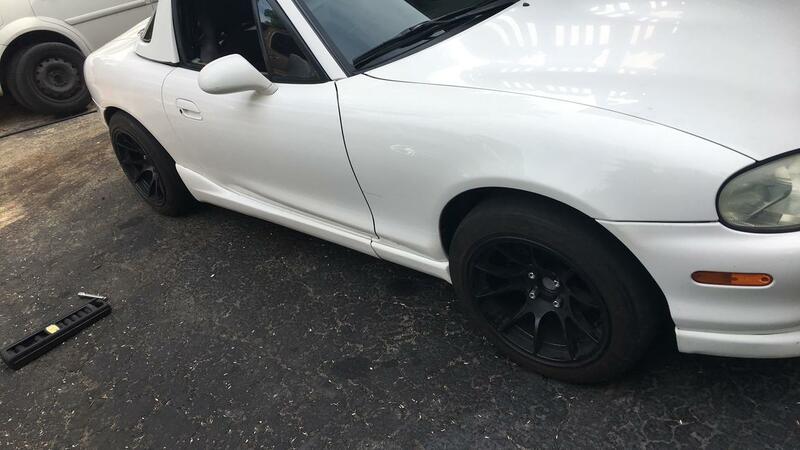 Looking at KMiata's site, I think that close to $8k is doable, although $9k is more comfortable. As for engine management, they offer a reflash, or Hondata chips are pretty inexpensive. But I get your point. Builder cars are not unlike factory ones in that most people can't resist the siren call of more nice stuff. Thus you have guys wondering why they can't get their money back out of their $60k Factory Five roadster. NickD said: Also, theoretically, you could use the kit to mount the BMW trans in a Miata, then toss out the bellhousing/flywheel adapters and bolt, say, an S54 to that trans in the Miata. Is the s52 too tall for a miata? 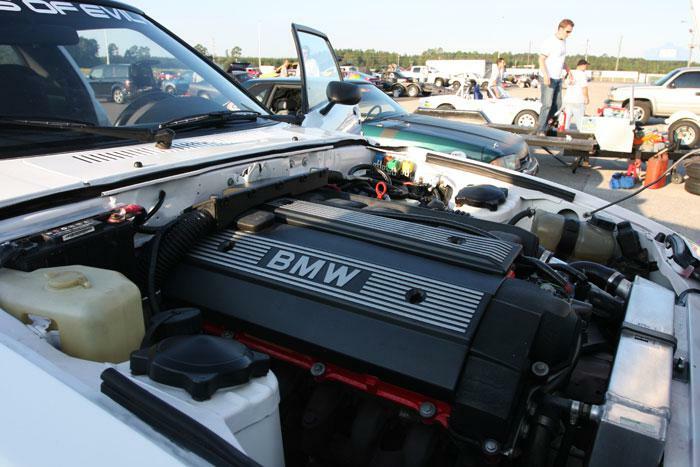 It's amazing how hard it is to find info about BMW engine size. The BMW is a pretty short engine with how far over it's tilted. Then again, I found out just how short the B6 is when I tried to put a volvo redblock in place of one. I can tell you from personal experience that an engine swap is going to cost time and money on a sliding scale. The easier it is (mounts, adapters, etc.) the more money it costs. I swapped an engine with similar architecture from the same manufacturer and did it as cheap as possible but it took a way more time. I've also heard similar from others and have been told "take what you think it will cost, and double it". I'm sure it can be done for 8k, especially with the craftiness of people here, but I'm sure it will take much longer to do between hunting out a good deal on parts and fab time. Not sure, but I know you can fit a Nissan RB in a Miata. Friend sent me a few years ago of an NB1 he encountered with an RB25DET under the hood. The owner admitted it was a bit of a pig in the corners but was terrifying in boost. Slightly off topic, anyone know what those wheels are? I set those guys up with FM to make and sell the wheels. They missed prices, weights, etc. I'd personally not support them. edit - looks like z31 beat me to it. Didn't know about the drama though. FM even stopped carrying them, IIRC. The story kept changing - first they were going to be forged Californian wheels, what came out was a flow formed Chinese wheel with a middleman in the mix. What was going to be an exclusive turned into a commodity. They showed up late and overweight. I don't know if we ever did get all our money or product. 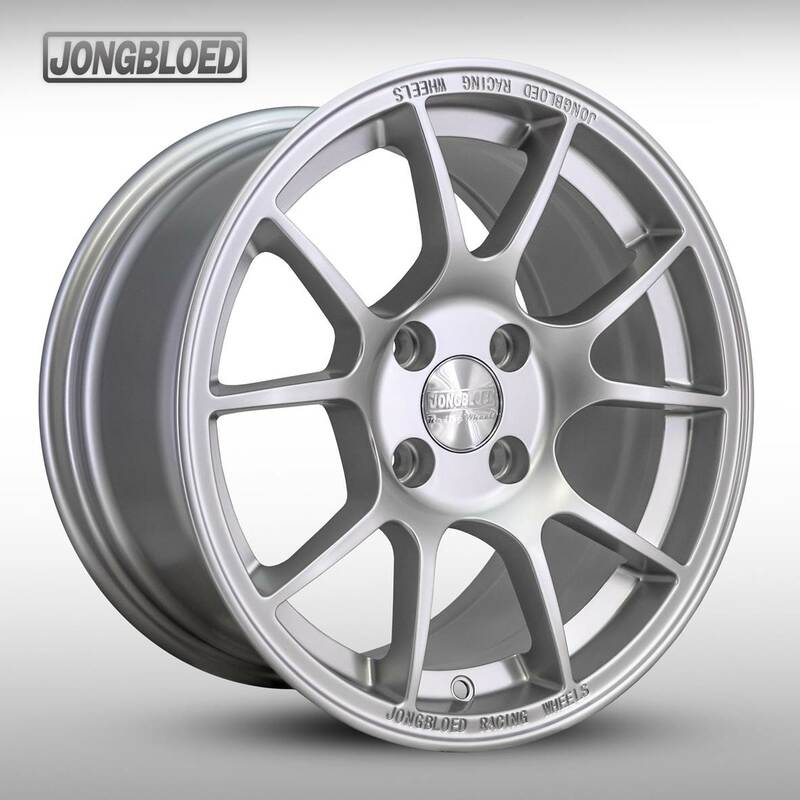 Great looking wheel and it was a way to get a 15x10 for $108. But not someone I'd ever do business with again. We became the world's biggest 6UL dealer instead. Can anyone confirm if thats's a GTC 300 or 200? And now they’re mine......hope they work well on the eco-miata. Wow, that's crazy! Shame that it went like that, they looked like they could've been a good fit for MR2. KyAllroad, if you ever want to let them go, lemme know! No kidding, it's a great looking wheel.